The Langebaan Lagoon on the Cape West Coast is a favourite with locals, offering some of the best windsurfing inSouth Africa. 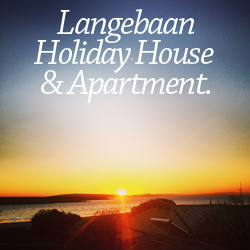 Langebaan offers ideal learning conditions as well as high speed flat water blasting. With ideal flat water conditions, the Langebaan Lagoon invites you to play on the water for hours and is internationally recognised to be one of the top boardsailing venues in the world. Kraalbaai offers some of the best flat water blasting in the world, head into the national park and head to Kraalbaai. Located as it is on the shores of a tranquil lagoon the town of course offers a wide variety of water sports and activities, including kayaking, windsurfing, and its newer cousin, kite surfing, boat trips and fishing, as well as paddling in the shallows or simply enjoying the white sandy beaches. The lagoon itself forms a part of the West Coast National Park, a wildlife sanctuary and home to many indigenous and migratory bird species as well as small mammals, making it ideal for bird watchers and nature lovers alike. Windsurfing Lessons, Windsurfing equipment hire.